Next month, the long-anticipated second installment of the “Matrix” series will be out in the theaters, again returning public consciousness to the idea that what we think of as “real” should not be taken for granted. The timing is quite apt, as for those with eyes to see and ears to hear, there can be little doubt powerful political forces are capable of manipulating popular opinion to the point that the mass public triumphantly shouts black really is white, war really is peace, ignorance is strength and freedom is slavery. In this article we will reveal new information that, if we were living in a truly free world of information sharing, should be seen as a startling breakthrough, finally revealing the true nature and structure of our universe. Yet, experience has shown us that very little mainstream attention is given to such advancements, as the questions that are raised bring in all the “Pandora’s Box” elements of parapsychology and metaphysics… proof that the universe is a product of intelligent design, an Ultimate Being with holographic and / or fractal properties from the quantum to universal level, and that higher beings are actively conveying useful information to help us understand and answer these questions. In order to understand our “big” new discovery, we must start small. Most of us take the existence of the physical world for granted. Yet, what we “know” about physical matter hasn’t really changed much in the last 100 years. Despite a huge number of proven inconsistencies, the average person will probably still tell you that matter is made of molecules, which in turn are made of atoms, which in turn are made of little particles whirling around a nucleus like miniature planetary systems, filled with 99.999% “empty” space. Unlike Dr. Wolff, the average modern scientist will tell you that atoms are made of “wavicles,” something that acts like a particle when a scientist measures it as a particle and acts as a wave when a scientist measures it as a wave. This might seem plausible in a mathematical equation, but it is impossible to create a workable physical model from it. When you sit in your chair, you don’t have to believe it is a chair in order for it to hold you up. The fact of the matter, if you will excuse the pun, is that no mainstream theory even begins to solve all the paradoxes raised by quantum physics. Mainstream science does not know what matter really is. We cannot emphasize this enough. Most people think “we” know the answers, but no mainstream model has been able to solve the puzzle. Thankfully, enough university-educated people have written about these problems and attempted to solve them on the Internet that we do know the shortcomings of the conventional models. With the wealth of previously suppressed and / or de-emphasized research that is now available on the Internet, we can construct a vastly superior model of the cosmos that solves the paradoxes and answers the criticisms. This takes a great deal of time and care to articulate properly, and the results can be found in, Convergence, volumes I, II and III. For this article I would like to reveal some fascinating new information that I have not yet written about in the series. Figure 1 – The Masonic emblem. The “G” in the Masonic logo symbolizes geometry as well as God, the “Great Architect of the Universe.” Above the “G” is a compass and below the “G” is a carpenter’s square, these being the two main instruments through which a study of “sacred geometry” is conducted. (Lawlor, 1985) The aspirant is literally taught how to draw and meditate upon various geometric forms, understanding that he is coming into contact with the energies of Creation by doing so. Hence, any research that shows the importance of “sacred” geometry in quantum- and / or astrophysics, the very tiny or the very large, is not likely ever to surface into public view. Rev. CG Finney wrote how even in the late 1800s, members of the Masonic Order boasted that they had control of the US print media, government, military and justice system at the highest levels. (Finney, 1867) Finally, most people are beginning to understand how heavily controlled the US media really is – especially those who are not Americans and those who actively use the Internet for more than just email and instant messaging. Richard Hoagland’s Monuments of Mars (1990) documents how a simple four-sided pyramid known as a tetrahedron, when sized to fit perfectly inside a planetary sphere, will determine the most energetically active areas on a planet. The most obvious signs of this activity are the geometrically positioned Great Red Spot on Jupiter and the Great Dark Spot on Neptune. Notice the similarity between this diagram and the Masonic emblem in Figure 1. Figure 3 shows the “octave” of Platonic Solids, which illustrates the ancient Indian theory of how they correspond to the colors of the rainbow spectrum and the notes in a “pure Diatonic” major scale. Heliophysicists have discovered that the Sun has an “octopolar” magnetic field. Such a field maps out all the coordinate points for an octahedron, which looks like two Egyptian pyramids connected base-to-base. There are four evenly-spaced points along the equator of the Sun that are known to emit showers of charged energy “particles” like a slowly-rotating lawn sprinkler. Four times each month, the Earth passes through another wave of these particles, which are either positively or negatively charged. If you connect the dots between the four points of this energetic emergence along the Sun’s equator and its north and south pole, the octahedron becomes apparent – and we can see there is energy streaming out of all of its points. If the ancient scrolls are correct, then sacred geometry also has to be the ultimate solution to the problems and paradoxes of quantum physics, the science of matter. As documented in my third volume of Convergence, (DivineCosmos) Rod Johnson’s model has addressed every single paradox of quantum physics and provided a geometric solution to such long-standing mysteries as the derivation of Planck’s constant, the fine-structure constant, the weak / strong force ratio, the origin and structure of valence electron shells, the mystery of charge polarity, et cetera. The most effective way to explain why these geometric “stress points” emerge is vibration. 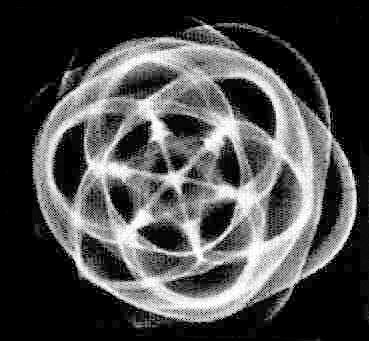 Credible researchers such as Dr. Hans Jenny and Dr. Buckminster Fuller have shown that all five of the Platonic Solid geometries will emerge naturally when you vibrate a sphere of fluid at a given “pure” sound frequency. The higher the frequency, the more complex the geometry will become. 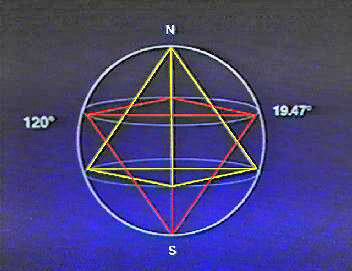 If you reduce the frequency, the original geometry will again emerge in exactly the same way. Hence, much as a snowflake crystallizes a moment in the activity of water, a given “pure” sound tone creates its own type of crystal in any fluidlike substance. We are not saying that there are literally geometric crystalline objects inside these planets or in the quantum realm – rather, geometry is the simplest form in which vibration may be seen in any natural medium, such as a fluid. The lines of the geometric forms define areas with a lower degree of pressure than their surroundings, and thus higher pressures quite naturally rush out through these areas, much as we see in the points along the Sun’s equator or in the Great Red Spot of Jupiter. The “fluid,” in the case of the Universe, is a non-physical energy medium that we call the “aether.” Our Convergence series, especially the third volume, gives definitive proof of its existence and fluidlike properties. In the geometry of vibration, all loose materials are caught up in the flowing pressure currents to collect at the points and lines of a geometric form. This is similar to how iron filings can be made to line up with the field lines of a magnet, thus making the geometry of the magnetic field visible. Another way of showing this effect is by spreading an even layer of sand over a large drumhead and then striking the drum in the middle – the sand will form into geometrically-spaced piles near the rim of the head. Sometimes lines are visible as well. Now let’s think big… really big. Imagine that each galaxy is like a speck of sand in the universe. Imagine that the universe itself is filled with an energy source that is vibrating, and has certain qualities that are similar to a fluid. In the model we are proposing, pressure currents throughout the universe would cause these galaxies to naturally drift into alignment with the borders of a matrix of geometric patterns, the result of which would look much like an ancient Indian mandala. We know that galaxies gather together into large clusters, known as “superclusters,” and that they can often be roughly spherical in shape. Each supercluster may contain literally billions of galaxies inside of it. Naturally, the average person assumes that these superclusters are scattered randomly throughout the Universe, nothing more than the aftermath of an explosive “Big Bang” where “nothing” exploded to become the Cosmos we now know. Let’s take a look at what scientific observation and mapping of superclusters by Drs. E. Battaner and E. Florido have shown. The distribution of superclusters in the Local Supercluster neighbourhood presents such a remarkable periodicity [i.e. ordered pattern] that some kind of network must fit the observed large-scale structure. A three-dimension chessboard has been suggested. The existence of this network is really a challenge for currently-suggested theoretical models… In this case, however, the identification of real octahedra is so clear and the network is so noticeably well-defined that a direct inspection is straightforward. A picture truly is worth a thousand words – and the obvious results of this Spanish discovery provide some of the most fantastic, undeniable confirmation for our Convergence / Divine Cosmos model that we have ever seen. In our opinion, this is every bit as important as the discovery by Nicholaus Copernicus that the Sun was at the center of our Solar System. Yet, once we knew what to look for, a Google search on “Battaner octahedron” only came up with 15 hits for the entire world of online information that could potentially have covered this fantastic discovery! Even more amazingly, this information has been around for nearly ten years! Why, then, is it so totally and completely obscure? [See Appendix 1] Could it be that this finding gets too close to Masonic secrets about the nature of Creation? With the reach of our publicity on the Internet, these obvious geometric structures in our Universe will soon become another piece of “common knowledge” for the new astrophysics model that we are helping to bring to the world stage. The baffling questions raised by this discovery have, for the time being, been effectively shut down by simple references to the rather boring, obvious-sounding idea that they are caused by “magnetic filaments” in the Universe. Consider the following text from no less than Caltech, entitled Large Scale Structure and Magnetic Fields. If you read the above paragraph carefully, you will note that Caltech says that “at least four” of the octahedra are easy to see. No one can change or “debunk” this fact – it is simply another piece of data that must be incorporated into any accurate cosmology of the universe. It is important to realize that this “chessboard” structure reaches as far as our instruments have been able to measure; the entire Universe of galactic superclusters appears to be arranged into a gigantic matrix of endless numbers of octahedra fit perfectly together like an endless egg carton, stacked at least three layers high. The only problem with this article is that there is no way to model an octahedron with conventional magnetic fields in the laboratory. We can, however, model it very easily using fluid dynamics. This, however, brings up the suppressed notion that there is a fluidlike, non-physical “aether medium” in the Universe, the source of all physical matter, which the Convergence series discusses in great detail. We do already know that the cosmic microwave background (CMB) energy of the Universe is roughly spherical, and that all the superclusters are in a “flat” area, like a pancake, in the middle of this sphere. Hence the “matrix,” when viewed from the top down, would have to look like a circle with a pattern of diamonds in it, similar to a lotus flower. Invariably, people would have difficulty visualizing this, so we realized we would need to make a diagram. Once a good visualization of the picture finally arrived in the mind’s eye, it took about 30 seconds to realize that the image had already been rendered… in the unlikely medium of a living wheat crop. What we see in the “crop formation” of Figure 7 is a simplified view of the structure of the Universe, looking at it from the top down. The diamond shape of the octahedron can be seen by connecting each raised triangle of crop (dark brown) to the downed triangle directly ahead of it, (light brown,) as you move from the outside edge of the circle towards the center. It is true that if we were to build this diagram on paper, it would be most accurate to render it entirely from straight lines. However, a straight-line diagram would probably be harder to see in an ungainly medium such as a wheat crop. Hence, it is quite satisfying to finally discover the structure of the Universe, only to realize that the solution had already been laid out for us by an apparently non-human intelligence nearly three years earlier. In The Fractal Octahedron Network of the Large Scale Structure, Dr. Battaner suggests the geometry of the octahedral matrix is “fractal,” meaning it has “self-similarity at all levels.” Larger octahedra are made up of smaller octahedra, which are made up of even smaller octahedra, and so on, ad infinitum. This conforms to the ancient teaching of “As above, so below,” the idea that the Creator is reflected in all things. However, up until a month ago, we did not know whether all the smaller octahedra in the matrix truly assembled into one single, vast octahedron. 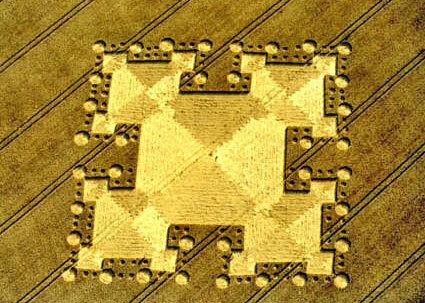 There is one enigmatic crop formation that appeared in West Kennett Long Barrow on August 4, 1999, seen here in Figure 8, which suggests that this is indeed how the universe functions. On 3/3/3, Dr. David Whitehouse published an article on BBC News Online that appears to confirm this “fractal” concept of the universe. The article discusses Dr. Max Tegmark’s work with the Wilkinson Microwave Anisotropy Probe, or MAP, which was launched in 2001. This probe is designed to measure slight temperature changes in the Cosmic Microwave Background (CMB) radiation in the universe, which is considered the “echo of the Big Bang,” the original leftover radiation from when the universe was first formed. Following is an excerpt from the article itself. Looking at the symmetry of the CMB – measures technically called its octopole and quadrupole components – the researchers uncovered a curious pattern. They had expected to see no pattern at all but what they saw was anything but random. Figure 9 – The octopolar / quadropolar structure of the CMB in the universe. 1. An “octopolar” formation on the surface of a sphere gives you all the coordinates to play “connect-the-dots” and draw an octahedron inside. 2. This discovery confirms Battaner et al.’s suggestion that the octahedron structure of superclusters would continue, like a fractal, to the entire Universe. 3. The Sun’s magnetic field is also a combination of quadropolar and octopolar formations. This shows a fractal / holographic connection between the Sun and the Universe – the same basic structure on different levels of size. The evidence that we have presented in this article suggests the structure of the universe is precisely determined by vibration, at all levels of size. If the frequency of vibration increases, then the geometry itself becomes more complex. 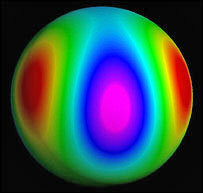 If the geometry of the atoms and molecules of so-called “physical” matter changes, then what happens to the matter? The idea of our world being a “Matrix based on rules” where “some of those rules, such as gravity, can be broken” might not be so farfetched after all. Free your mind. There is no spoon. To his credit, Dr. Nicolai Levashov was the first to include Battaner et al’s discovery and its spiritual implications for a “fractal” universe in a limited edition for-profit manuscript released some time in the mid to late 1990s. Apparently, the document is quite expensive and only a very small number of copies have circulated, primarily in the Bay Area of California. We thank Mark Comings, a featured guest speaker at our Time of Global Shift seminar in Huntsville, Alabama last November, for bringing this to our attention. How did we miss the importance of the geometry? Had we seen a picture of the structure itself, or heard that it had anything directly to do with the Platonic Solids, it never would have happened. Our mistake was a classic one, in that we chose to blindly agree with S.N. Kimball’s assertions that the presumed “chessboard” structure did not actually exist, but was only a subset of something larger – namely, a Super-Galaxy formation composed of all the superclusters in the Universe. There simply is not enough time to explore every single lead from every single data point that we have included in all three books, but thankfully the “Internet peer review” process has been quite beneficial due to the visibility of our website. As you can read in the above section of Divine Cosmos, the long-range structure of the “chessboard” has only been measured by taking a very narrow slice of data, similar to analyzing one line scratched from the center hole of a vinyl LP to its far edge. Kimball believes that the Piscis / Cetus region in Figure 6 is showing us a narrow slice of one arm in a giant Super-Galaxy. Indeed, there is a slight curvature to this cluster, and Battaner et al. state in their papers that this “gravitational distortion” is simply caused by the larger size of the cluster. The bottom line is that the “chessboard” structure of superclusters is easily visible for extremely long distances in the hard data, but despite S.N. Kimball’s enthusiastic speculations, we do not actually see the arms of a super-sized spiral galaxy. Furthermore, the matrix of octahedrons is at least three octahedrons tall, further complicating the idea that any of the edges of these octahedrons could connect together to be part of a galactic spiral. We do know, however, that all of the superclusters in the Universe are in a flat “pancake” (lenticular) structure, similar to the shape of a galaxy. As the data in Chapter 7 of Divine Cosmos shows, there is a definite, obvious “fractal” connection between the structure of the Universe and that of all other size levels. The structure of the Universe appears to be a far more ornate, perfect and precise geometric version of what exists potentially in a galaxy, thus making its structure more akin to what we believe is found at the very tiniest level in the quantum realm. 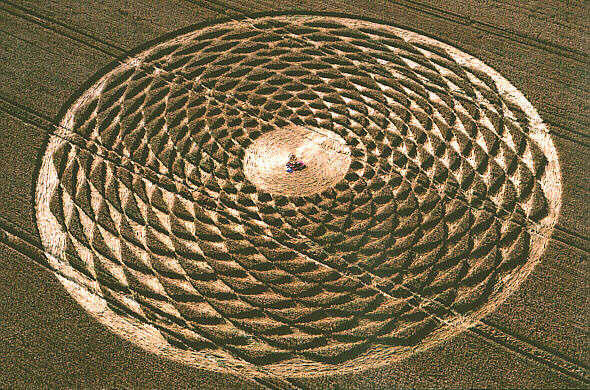 This can be seen in Figure 7 of this article, as rendered in a “crop circle” formation. By the fractal principle we should also see at least the beginning stages of similar geometric arrangements between the arms of our own Galaxy. Indeed, Dr. Paul LaViolette has discovered curious geometric alignments between pulsars in our galaxy, and this could be a partial satisfaction of our theory. We will have researched this data in more detail for the final version of Divine Cosmos when it becomes available, hopefully by August. Wilcock, David. Convergence, Vol. I, II and III.